Bert Olmstead and Carl Brewer are two all-time Maple Leafs, both members of the 1962 Stanley Cup champion team. Both are on my “Ten best Leafs of the past 50 years” list. (Click to read the earlier story.) But they were far from close, it seems, witnessed by comments Brewer made many years ago before his passing. 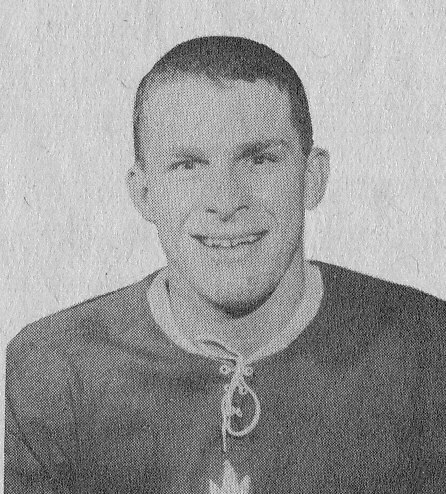 Olmstead was a hockey warrior for many years with the Montreal Canadiens before coming to the Leafs in time for the 1958-’59 season. Olmstead, by most accounts, brought a tough, no-nonsense attitude to the Leaf dressing room. He joined a club that had had no playoff success in several seasons and often missed the playoffs. 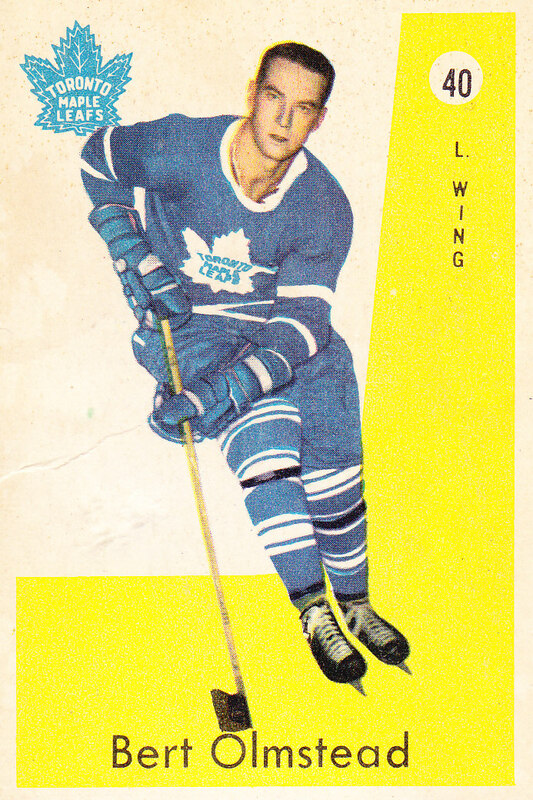 His approach helped bring a winning attitude to the Leafs, and ultimately helped lead to that Cup in ’62. During their dialogue on Leafs TV, Brewer spoke at some length of the personal dislike between he and Olmstead. He didn’t see Olmstead as contributing to the Leafs’ success any more than any other player. He dismissed the notion that Olmstead brought more intensity to the game than anyone else. In fact, and I think I have this quote quite accurate, “There is only one level of intensity and all players play at that level”, said Carl, or words very much to that affect. Interesting comment from a guy who was a world-class player. Brewer was looking back at his time as a professional and overtly rejecting the notion that Olmstead was any more “intense” than any other player. He expressed amazement that other young players so admired, looked up and listened to Olmstead. He didn't get it. Other teammates of Olmstead that I have spoken with over the years disagree with Brewer’s assessment. Hall-of-Famer Dickie Moore, for example. But Brewer was always his own man, too, just like Moore and Olmstead, and seemingly didn’t follow the paths of others. If I’m not mistaken, Brewer was the guy, along with longtime Leaf teammate Bob Pulford, who helped bring Alan Eagleson into the league as a player-agent. Eagleson went on to become the most powerful and influential man in the sport. Ironically, Brewer was hugely instrumental (not quite single-handedly but pretty close) in bringing Eagleson down many years later, and in also helping former players recoup monies that had been essentially stolen from them by the NHL itself. A unique individual in the world of professional hockey at the time, Brewer left the Leafs suddenly in the fall of 1965, and pursued his education, achieving his BA. He then became an amateur player again. He actually played for Canada, I believe, at the 1968 Olympics in France, but I may be off on that. I know for certain that he did play for a while in Europe. Later, he came back to the NHL with Detroit (his rights had been moved to the Red Wings in the huge Frank Mahovlich trade) and then the St. Louis Blues and was an end-of-season all-star. He was an independent thinker, an individual, for sure. I was never a high-level athlete and Brewer knew more than I do about “intensity” in professionals sports. But having interviewed hundreds of other professional athletes over the years and speaking to and working with countless others, I can’t quite agree with his assessment. Some players just are more intense than others in their focus and in the way they play. There are, to me, different levels of intensity. Jonas Hoglund, a talented offensive player with the Leafs a few years ago, didn’t play with the same level of intensity as Mark Messier, for example. Bobby Clarke played with more fierce determination than anyone I ever saw. Also, athletes sometimes play with more intensity at certain times then others. Momentum shifts are part of this, but I couldn’t support the argument that all players are the same in this regard. It makes no sense to me. I wasn’t there in the dressing room in the late 1950s and early '60s. I was just a young fan, who thought that Brewer was a tremendously talented player, if a bit on the cheap side at times in terms of his antics. But Olmstead was a determined, passionate player. He may not have influenced Brewer in a positive way, but the evidence stands that he was significantly instrumental in making the Leafs a tougher team to play against in the four seasons he was there (he left on waivers after the '62 Cup, and retired)—and a championship team, too, in part because of the influence he had over most of his teammates. Whether there was something personal between Olmstead and Brewer, two great former Leafs, I don’t really know. But whether they got along or not didn’t stop them from helping the Leafs win that Stanley Cup in 1962, the first in my lifetime and one that I always think back on fondly. All you have to do is watch a team play a few games in a row to know that there are definitely different levels of intensity from player to player, from game to game. I've always liked Carl Brewer - Horton/Stanley, Brewer/Baun are my touchstone pairings - but he was way off on this one!